The journey continues! Continuing on from Part I of this fish story, the answer finally hit me as I was strolling at a local strip mall: mango salsa! This panini recipe was lacking vibrance and what says “vibrance” in culinary speak better than mango salsa? Now, of course, that addition does start to deviate from a typical fish taco. Aw heck, who cares? At the end of the day, I wanted a good sandwich and if that meant I had to scrap the San Diego inspiration this go-around, no big deal. I will give the city its due another time, I promise. Want to skip ahead? 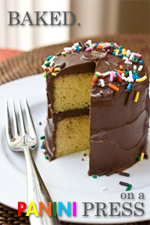 Click here for the final recipe. Yep, you read right – with the addition of mango salsa, we’ve now moved on from Baja to the Caribbean! Islands where reggae, calypso and mangoes abound. Not that they don’t have mangoes in Baja…they just have more tropical vibe, you know? THE PREPARATION: Given my previous experience with over-moist ingredients turning the bread soggy, I did want to be careful with the mango salsa. I had to kind of make it more of a mango pico de gallo, without any extra liquid like lime juice. I’ve never actually made this before but I’ve eaten it enough times to know the basic flavors I wanted to include: mangoes (obviously), red onion for flavor and color, cilantro for fresh, herb-y flavor and avocados for color and because I love avocado. I toyed with adding a jalapeño pepper for heat, but thought better of it when I remembered that there were already jalapeños in the pepper jack cheese. 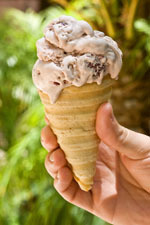 After combining all the ingredients, I got out a tortilla chip and gave it a taste – excellent! I altered the breading method just slightly this time: instead of seasoning the fish directly, instead I added 1/4 teaspoon of sea salt to the panko crumbs. THE CONSTRUCTION: I built the sandwich in the same manner as in Attempt #2, except for this time I substituted the mango salsa in place of the cabbage. THE RESULTS: Pretty good! The mango salsa gave the sandwich much more flavor than the cabbage had. Plus it looked nice, with the bright colors and all. My only gripe had to do with the avocado – as much as I love it, it came off as bland and mushy in the panino. It had to go. I crossed my fingers that Attempt #4 would be the one! I knew I was getting close. I picked out the avocado chunks from my mango salsa and built a fourth – and hopefully final – panino. THE RESULTS: Yeah, mon! 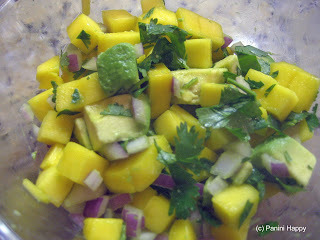 With the removal of the avocado, the mango salsa packed the sweet flavorful punch that I’d intended, without being too wet. The panko-breaded fish was crunchy and light. The lime dressing gave a light flavor and necessary moisture to the sandwich. And the crisp, toasted sourdough encased it all in a satisfying way. 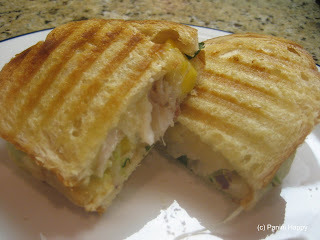 This panini recipe may not have ended up where I originally thought it would, but it ended in a great place! The Great American Sandwich Guide is Now Mobile! Congrats to the “Simply Suppers” Winner! Congrats to the “High Flavor, Low Labor” Giveaway Winner! I love your recipes. You are so talented!! I am going to try this one next. It looks delish :-)I really enjoyed the apple turnover one. It was a great way to have a “fruit” serving in the evening with my dinner! This one sounds especially good to me.